You are invited to ISACA's April eSympoisum and the Virtual Seminar and Tradeshow (VTS) and gain valuable CPE hours! Does your enterprise struggle to manage endpoints while maintaining continuous compliance? As technology evolves and as enterprises adapt to changing business needs, it is important to practice sound information security management in order to maintain and optimize the effectiveness of these endpoints. Hear our experts discuss continuous compliance and endpoint optimization, and answer your questions live! And you have the opportunity to earn up to 3 FREE CPE hours. Whether your IT deparment has implemented a cloud strategy or is planning to implement one, there are many business and technology issues, particularly those related to security and compliance, that must be taken into consideration. You will hear from industry experts and receive guidance on how to develop a cloud strategy that fits your individual requirements, choose the delivery model for your particular cloud computing initiative, establish user provisioning and de-provisioning processes for the cloud, and more. Plus, you can earn up to 5 CPE hours! For registration or more information, please visit ISACA website. ISACA eSymposium: Compliance or Noncompliance - What is the Cost? You are invited to ISACA's May eSympoisum for the opportunity to earn 3 CPE credits hours! The Ponemon Institute and Tripwire have teamed up to compile their annual report on the cost of compliance, and this month our speakers will be taking a closer look at the findings and how compliance and noncompliance can affect your enterprise. Learn more about indirect and opportunity costs of compliance and what you can do to reduce cost and optimize output. Join us for the discussion and take advantage of the opportunity to have your questions answered live by our experts! For a complete program overview and to register, please click here. You are invited to attend Oceania CACS 2011 – the annual ISACA Oceania conference hosted by the Queensland Chapter, 18 - 23 September 2011, Brisbane, Australia. The conference theme is "Navigating a Steady Course in Uncharted Waters – protect, govern, empower". Keynote speakers include: Bruce Turner – Chief Internal Auditor, Australian Taxation Office; Glenn Poole – Auditor-General, Queensland; Tony Hayes – Associate Director-General, Department of Communities. Conference highlights include: 50+ presenters in three separate streams; two discussion panels each of three CEOs and three CIOs respectively. Participate in this meaningful event and register now. You can also submit your paper and speak at the conference (registration fee waived for speakers). For details, please click on below link. Invited by Dr. Patrick Lee, academic advocate of ISACA Macao Chapter, Mr. Daroon, member of ISACA Student/Academic Subcommittee (SAS) gave a guest lecture with topic of "IS Audit & Role of an IS Auditor" to the students from Business Technology Management class, the Masters of Science (Accounting) on 22nd March 2011 at the University of Macau. Mr. Geoffroy Thonon, president of ISACA Macao Chapter was also invited as a representative of the chapter to introduce the history, past and current works of the chapter. Within one-hour talk, Mr. Darron has shared what IS auditing is about, the role of auditor and its job coverage, as well as IS auditor's career path. Students were actively involved in the lecture and raised lots of questions. 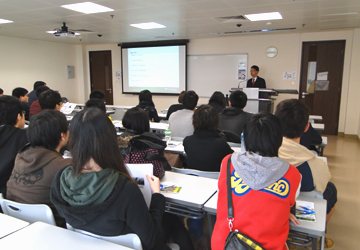 The lecture also provided a chance for ISACA to give a positive message and impressive impact to the students. 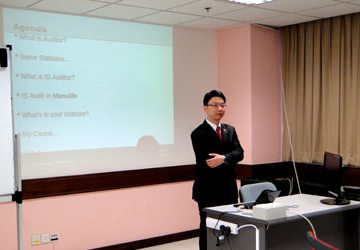 Mr. Daroon, member of ISACA Student/Academic Subcommittee (SAS), introduces ISACA's cerfications to the students. 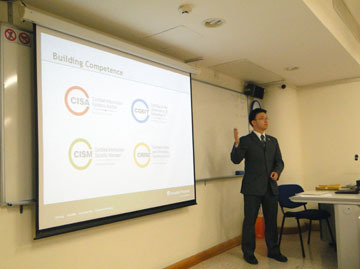 Invited by Macao Polytechnic Institute (MPI) and the University of Saint Joseph (USJ), Mr. Darron Sun, member of ISACA Student / Academic Subcommittee (SAS), gave two sessions of career talk with topic of "Audit Excellence - Role of IT Audit" to the MPI students majoring in E-Commerce at MPI, and to the USJ students majoring in Information Security at USJ on 16th March 2012. Within one-hour talk, Mr. Darron Sun has shared what IT auditing is about, the role of auditor and its job coverage, as well as his experience and sharing of career path. Students were actively involved in the talk and raised lots of questions. The talk also provided a chance for ISACA to give a positive message and impressive impact to the students. Mr. Daroon Sun, member of ISACA Student / Academic Subcommittee (SAS), shared his experience and advice on career path for the undergraduates.